Meghan's Race Reports: Way Too Cool! 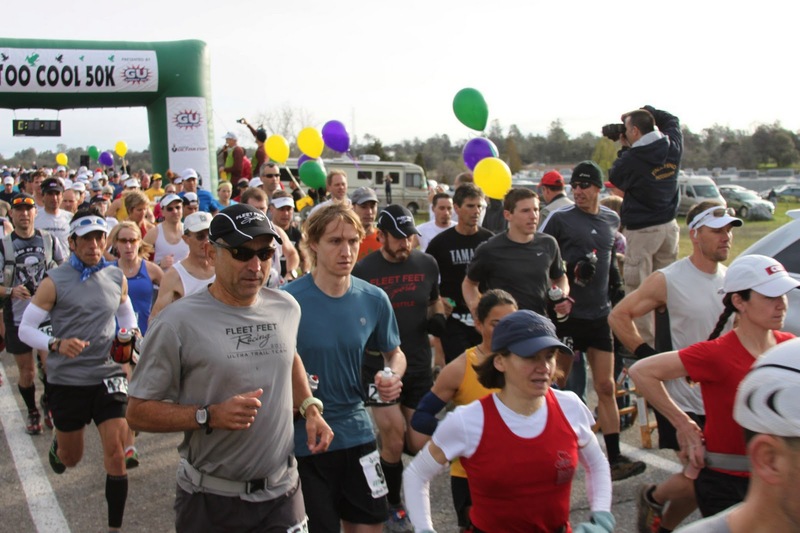 Verbose, detailed reports of my races - from 5k to 100 miles! This winter's training has been the most successful one I remember. I have been consistently working out with Sunsweet Team-sters Craig, Jeff, Lewis, and Dan, with good results - at least on the track. 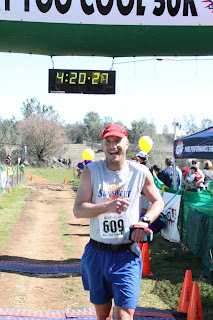 I had given Craig the satisfaction of beating me by nearly a minute in the 4- mile Truffle Shuffle in early February, but was betting that I would beat him by 6 minutes at this year's Way Too Cool 50k. A little after 7:00 on race morning, Craig, Todd Braje, Lewis, John Ticer and I headed out for a warm-up and preview of a bit of the new course. It was promising to be a great day, weather wise, with blue skies and cool temperatures. Back at the start area, decisions on clothing (hat/no hat, gloves, sleeves) were made and I headed for the start. Craig and I ran some strides, and bumped into Jed Tukman, one of my pacers for Western States this June. Jed said to me "I'm going to stay behind you this year, because I hate it when you pass me!" I told him that was a good idea. 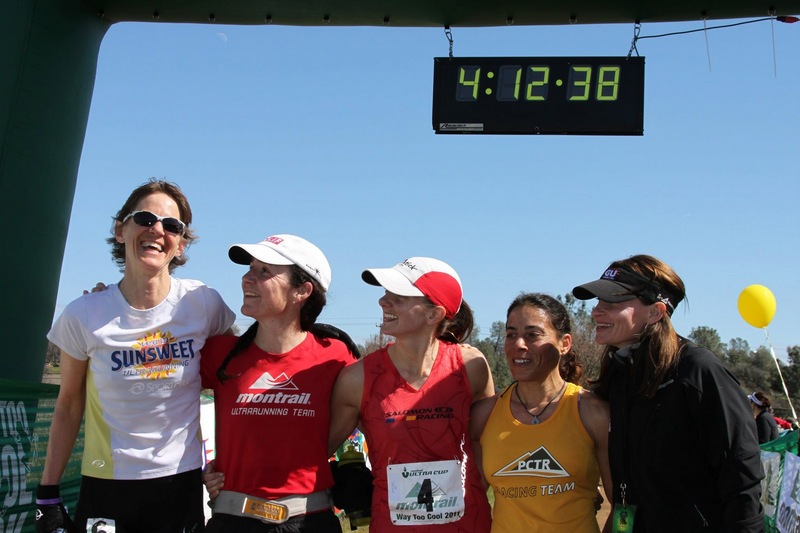 I lined up next to Joelle Vaught and Caitlin Smith, both previous winners of this race. I had mentally seeded myself 3rd to those 2, but never allowed myself to think that I couldn't win. Caren Spore was behind me, fit and ready to go as always. After a greeting to the masses from RD Julie Fingar, the countdown began. Finally, we were off at a quick clip. I was with Joelle and Caitlin for about a half mile before they began to drift ahead. Jed was unable to contain himself as was Craig, and they both pulled away from me early. My first mile felt faster than the 6:40 I clocked and I wondered then and there if I was not going to have a good day after all. The only wildlife I would see all day was surprising - a gorilla jumping out of the bushes randomly scaring runners, as we hit the single track of the new part of the course. That was a first for me. The trail felt sweet beneath my feet. 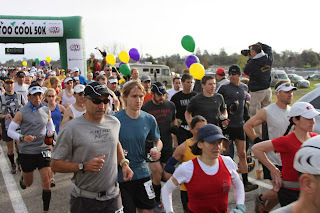 I was running right behind John, and could no longer see Craig, Jed, Joelle, or Caitlin. After the first stream crossing, the trail wound upwards, and my heart rate was getting out of control. Ugh - so early, and runners pulling away. A train caught up to me and hung on me heels for the next few miles as we wound through a beautiful oak savanna. The runner behind me asked if he was annoying me being so close. "Not at all". He hadn't run an ultra in some time and was not sure how hard to go, liked my pace, and decided to stick there. Some bikers were out on the course, cheering us on, and one of them said "Good job, Caren!". Great. Caren is right behind me. I yelled back "Are you stalking me Caren?" I'm not sure she heard me, but shortly after she passed me at a water crossing, and I hung on her heels all the way to the end of the first loop. At that point she urged me to go ahead as we were hitting the long down hill section, which is my strength and her weakness. Finally, things started to click in my body. I surged until reaching the next new part of the course - the Western States Trail down to the lower quarry road. What an absolute blast! The perfect downhill pitch for flying. When it finally ended and we crossed hwy 49, I was certain I would not see Caren again. I grabbed a couple of cups of water, downed them, and forged on. I was experimenting using a gel flask rather than packets to see if I could improve on my calorie intake during a race. Historically, I would get behind on consumption due to inattentiveness to time and the nuisance of opening gel packs, the sticky mess, and lack of getting all the contents in my mouth. Today, I was taking periodic nips of gel, trying to stay topped off all the time. So far, so good! Clipping along the lower quarry road, my Garmin was registering about 7:00 miles. It was a good effort, but I didn't want to go any harder. I realized the Caren can easily be running that pace, and as the road began including some climbs, she inched her way back to me. 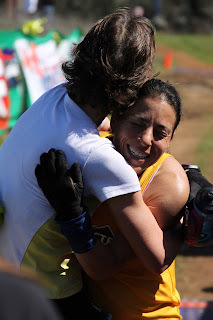 We ran together for awhile and I said "I think we would make either a really good Trans-Rockie team or a really bad Trans-Rockie team" - a race where team mates must start and finish each leg together - and we concluded we would probably be pretty good because we would always be containing each other - she would have to slow her climbs and I, my downhill. She pulled away from me before Maine Bar aid station, and I stopped to get my bottle filled. John was still there and waited for me, and we ran out together. He said Craig was about a minute ahead and that he was tired of trying to catch up to him. 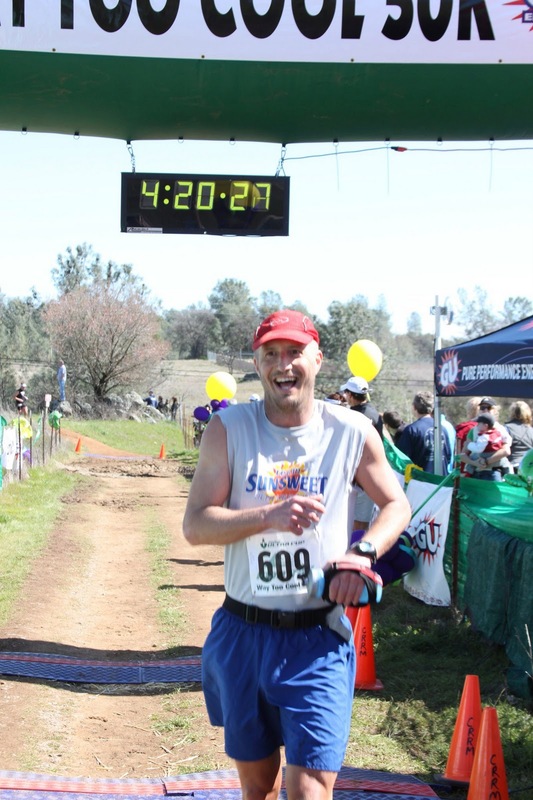 We settled into working together, which we do very well, as we have run most of White River 50 Mile together, he paced me to a win at Where's Waldo 100k, and we have done numerous workouts on the track and long training runs together. Come to think of it, Craig should have been with us from the start. Maybe then....but I don't want to spoil the story. As usual, Jady Palko caught up to me, and I chatted with him for a bit. Jady is known for his sporadic bursts of speed followed by tortuous slow downs, but he seems to enjoy himself. He apparently tired of my talking and flew ahead, only to be passed by John and me shortly after. We took turns leading, and I wondered when the heck I was going to see Caren, or was she feeling so good that she would catch the leading ladies? A couple of stream crossings were so deep I wondered if she had gotten swept away. John noticed my untied shoe and made me tie it. I told him to keep moving and make me catch up. As I started to reel him back in, he started to pick it up, and fairly soon, we were beginning to roll. We flew into ALT, I grabbed and S!Cap, drank two cups of coke, and was gone. John then had to run hard to catch me, and we kept the pace going. I was feeling great, and suddenly ahead of me I spied blue shorts, grey shirt, and red cap. Not remembering what color hat Craig had on, I yelled back to John "what color hat is Craig wearing?". I got no reply, so I asked louder (we are getting older, after all). A very reluctant "Red, yes, that is Craig". I did a little happy jump, and John reined me in with a "Just wait, be patient", but what I heard was "Pipe down for crying out loud!" I did a little yoga breathing, and John and I silently caught up to Craig. I put my arm around his shoulder and he said "I wondered when you guys would catch me". In a very sympathetic voice I said "how's it going?" He said "oh, up and down". I took off, baiting him with an invitation to "work with me!" but he declined. 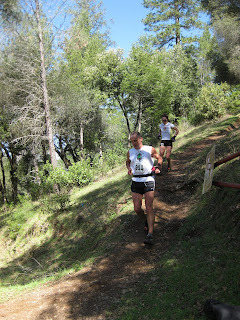 John and I kept up our strong pace, passing a couple more runners before we hit the base of the big climb up Goat Hill. I spied Jed and yelled out to him. He was a sack-a-woe, cramping and beat. He tried to run with me, and I chided him for not sticking to his plan. I told him his job at Western States is to make me hate him, and he said he hated me already. "But you can't drop me at Western States" I said as I left him to struggle his way in. I managed to stay ahead of Caren by a few feet all the way about half way up the trail before the hwy 49 crossing. She is a superior climber, and she pulled away a good 10 yards by the time we crested. My long legs pulled her back and we crossed the hwy virtually together. She ran close to the aid station table and whether she was planning on stopping or not, I yelled at her "don't stop!" I wanted this race to play out with no excuses. She stayed in the lead as we climbed out of the aid station, and somehow I managed to stay right on her heels in the lower section. As soon as we hit the steeper, rocky section, she gapped me again. We had less than a mile to go, and I was about to explode I was breathing so hard. I only hoped she was breathing hard enough to not hear mine, as it is kind of embarrassing. At the top of the rocky section she had 20 yards on me. My mind was no longer in the game, but my body completely took over. My legs unwound and ate up the ground beneath me. 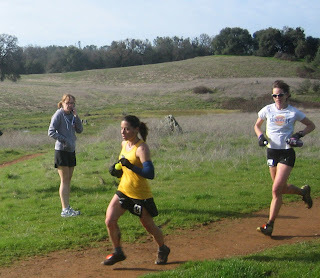 Caren was getting closer and closer, and at the very top of the climb, I caught her - with a quarter mile to go. "Let's go!" I shouted between gasps. "I'm done" she said. I clambered down the steep dip before me, fumbled my way up the other side, and ran as hard as I could. "She may think she's done, but I know better than to give an inch," I thought to myself. I did try to look back, but couldn't see anything. I crossed the finish line, 4:11 flat, and Caren, a mere 11 seconds back. We embraced, and laughed at how much we hated each other. Of course, in reality, I love her for what she brought out in me, and I think I did the same for her. Without our race, I would have easily been a minute slower. I found that my body could actually take over my mind, rather than the other way around. Joelle and Caitlin added their bit of drama to the finish with Joelle taking over the lead the same place I passed Caren. This was my fastest Cool ever, even though with a different course it is hard to compare. My energy levels were great for the entire race, so the gel flask is 'in'. John finished in 4:15, and the 6 minutes I had predicted I would beat Craig by turned into 9. Hmmm - 4:20:27 minus 4:11....that is MORE than 9 minutes. Photo by Chuck Godtfredson. 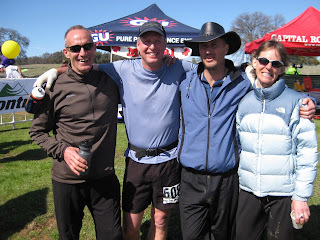 He and Jed both say they are going to stay behind me at Lake Sonoma 50 Mile on April 2nd. Really? We'll see. John Ticer, Chris and Craig (you can take the boys out of Cool, but you can't take the Cool out of the Thornley Boys) and me. Photo by Carole Connor. That picture of you and Caren is priceless! So awesome. Congrats on such a fun battle! Looks like a blast. What a great recap. I loved reading it. thanks! Just for the record, my gun time was 4:20:17, so Chuck was a little late on the photo. 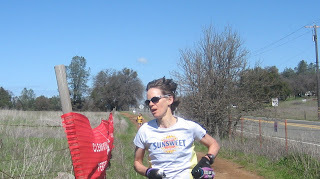 Jed and I will try again to be a little smarter in two weeks at Sonoma 50 mi. But then again, if we run a smart race and stay behind you the whole time how much fun will that be for you? @Devon - yes, if you were in the photo, I'm thinking your head would have been cut off. @Craig - having you behind me all day would be awesome. You could exhibit your superior speed and out-kick me at the end. The best line was: "I yelled at her "don't stop!" I wanted this race to play out with no excuses." That says volumes. Congratulations, lady. I loved your description of the end of the race. I felt like I was there. Great Finish! Nicely done! Looking forward to seeing you take down some age group records this year. Nice work, once again. I know that you don't know me, but I'm a local Corvallis girl and follow your racing. As a girl in her early 30's who's feeling like I'm getting a late start in the racing scene, you inspire me, Meghan. Fabulous race and report, Meghan! Too bad you're not getting to test everyone again this weekend at Sonoma - but it would've been a swim. Come on down and visit sometime. Fun report - nice writing. you are an inspiration. Nice lock on the Montrail Ultra Cup!